GenreOnline.net: Boldly Going Forward In January, 2014. HOLLYWOOD, Calif. (November 8, 2013) – The original starship Enterprise continues its historic voyage into the final frontier of high definition when STAR TREK: ENTERPRISE—SEASON THREE on Blu-ray makes its debut on January 7 from CBS Home Entertainment and Paramount Home Media Distribution. In addition, the Blu-ray includes bonus material previously released on DVD such as commentaries, deleted scenes from select episodes and archival mission logs for an in-depth and immersive viewing experience. With breathtaking 1080p high-definition picture and remastered sound, the STAR TREK: ENTERPRISE Blu-ray releases have received rave reviews. 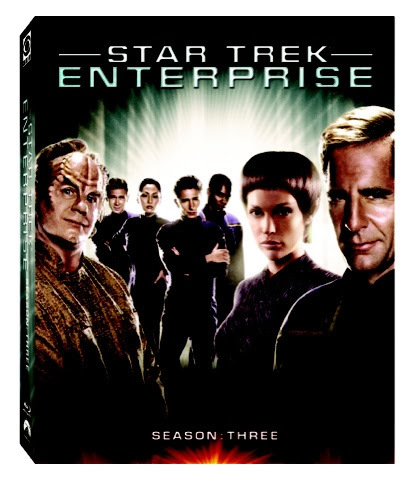 Starring Scott Bakula, Jolene Blalock, Connor Trinneer, Dominic Keating, Linda Park, Anthony Montgomery and John Billingsley, STAR TREK: ENTERPRISE follows the adventures of the Enterprise NX-01, the first Earth-built vessel capable of breaking the Warp 5 barrier, and her intrepid crew of brave explorers. In addition to all-new commentary tracks on select episodes with some of the franchise’s most notable names, the high-definition collection includes the newly produced “In A Time Of War.”This retrospective, multi-part documentary offers fans an inside look at the making of the series’ groundbreaking third season, which was the first in the franchise to feature a year-long story arc. In this piece, the writers and production staff discuss the complexities of plotting the Xindi story arc along with the development of the key themes seen in the show’s pivotal third season. The collection also includes the exclusive featurette, “Temporal Cold War: Declassified.” In this never-before-seen piece, the show’s creators, cast and production team reveal details about the original story arc that was never fully explored; in addition, the group discusses how the temporal cold war would have ended if the series had continued. In A Time Of War: (HD) – NEW! Temporal Cold War: Declassified (HD) – NEW!